At a stall at the Byward Market in the city of Ottawa, Ontario, decorative glass salt and pepper shakers and soap containers are some of the art which is on display. Visitors to the Byward Market in Ottawa, Ontario, will find many stalls which feature an assortment of handcrafted art work. 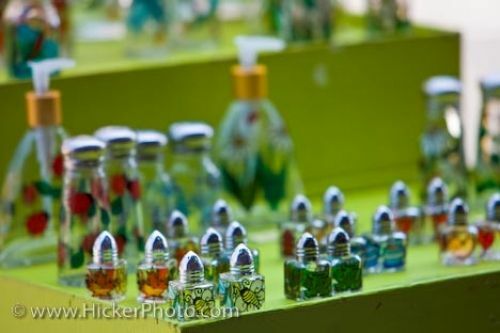 This particular market stall displays decorative glass salt and pepper shakers of various sizes and soap containers which have all been handpainted with different pictures on them. Picture of the decorative glass art work at a stall at the Byward Market in the city of Ottawa, Ontario in Canada. Handpainted glass salt and pepper shakers at the Byward Market, City of Ottawa, Ontario, Canada.